← An “After Xmas Sale” that starts BEFORE Xmas? I believe it has become an annual tradition for Vibram to offer a freebie to customers who buy at least 3 Vibram discs during the holiday season. (In 2014 that meant Nov 13th-Dec 31st.) Before we get into that freebie let’s take a minute to think about how this benefits everyone involved. Buy 3 Vibram discs from any Vibram retailer. Submit a copy of your receipt on Vibram’s offer page. Await your cool free gift of the Lugs game AND a Vibram patch. Note: This Vibram patch is not a retail item. This is the only way to get it! Retailers should get some extra business from Vibram’s promotion. Q – So What’s The 2014 Promotion? A – A free Lugs game! 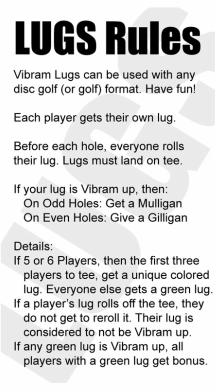 Lugs is a simple concept and is much more fun than a text description makes it sound – just like disc golf itself! You don’t really win the game of Lugs. It just helps (or hinders!) you in that pursuit. You still have to win the round of disc golf. Each player gets their own colored Lug. When arriving at each teepad everyone roles their Lug. If yours lands Vibram side up (landing ON the teepad is required!) you get a mulligan. Try it out. Have fun. Let Community & Vibram know how it goes. We hope to see Lugs and the Vibram patch as regular retail items someday. Visit CommunityDiscs.com/Vibram to get great Vibram discs and goto the address below to get your free Lugs game (must purchase by December, 31st 2014).